Amina Ambrose lives with her mother, father, two sisters and brother in a country ruled by a dictator. Amina and her sisters have to wear coloured headscarves that identify their age and they have been banned from education since the tyrant came to power. Amina can’t help asking questions that get her into trouble – “Why does it have to be this way? Why can’t we change things?” – and she is constantly told she has too much imagination and should keep her head down. To Amina’s delight, and to the relief of many people, an army arrives to liberate the country. She assumes that the old regime will be got rid of quickly, but things only go from bad to worse. The government cracks down on minority groups, and Amina is forced to wear a badge to indicate her cultural and genetic heritage; a badge that can only divide the population, not unite it against their rulers. 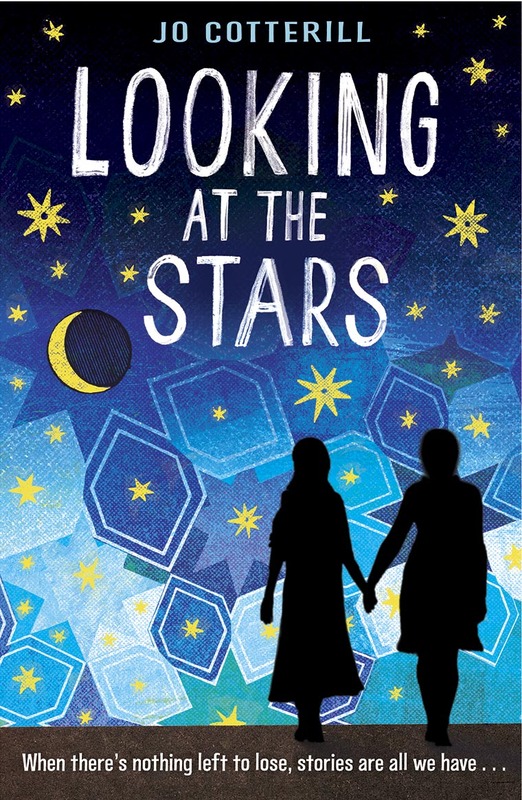 Looking at the Stars was published on 30th January 2014 in hardback and in June 2015 in paperback. It’s suitable for readers of 11 upwards because of the content. Themes: civil war, oppression, death, poverty, refugees, discrimination, imagination, hope, family, loss, love, friendship, the power of storytelling. This book is the best book I’ve ever read. I have lost ount of the times that i have curled up in my bed with this book, and devoured it, drinking in every word. It is a delight from start to finish. Before i know it it is 5:00 in the morning! Hi Aya, what a lovely message, thank you so much! No plans for a sequel as yet, I’m afraid…maybe one day! Is this book real and what is the time period? Hi Daniel! Looking at the Stars is a work of fiction, not set in a named country. Is that what you were asking? The time period is contemporary – so, now, but in a third world country, not a Western one. Hope that helps! HI Jo, thanks for awensering, i’m actually doing my English project on this book! one of the tasks was a timeline so that’s why i was asking. I am the Young Producer for Journeys Festival International produced by ArtReach. Our festivals across Leicester, Manchester, Portsmouth and Europe celebrate the amazing talent of refugee and asylum seeker artists through an exciting programme of events in each city. Last year you were kind enough to donate a copy of Looking at the Stars to our Floating Library. I am leading the project this year and revitalising the library and wondered if you would like to donate a fresh copy?